Honda Cars Philippines, Inc (HCPI) Honda’s automobile business unit in the Philippines will be conducting a dealer tour for the New CR-Z 1.5 IMA from December 28, 2015- January 14, 2016. As 2016 rolls in, HCPI would like to give customers the opportunity to see their newest offering, the 2016 CR-Z 1.5 IMA. The new sports hybrid will be in select dealers across Luzon in anticipation for the official launch on January 2016. 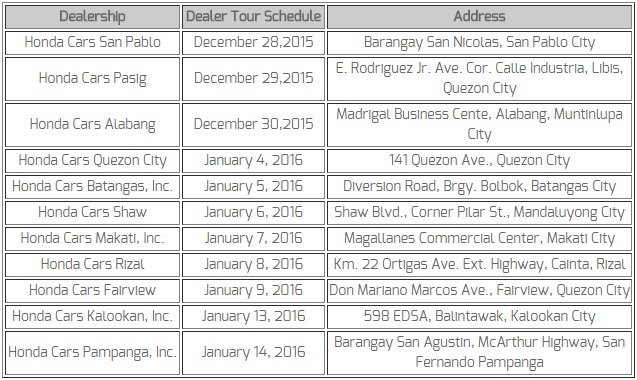 For the schedule of the official dealer tour please refer to the table below. This dealer tour gives customers a concrete feel of the 2016 CR-Z’s newest features. Customers can see and feel for themselves how the New CR-Z 1.5 IMA redefines the sports car by combing the power of a coupe and the smart technology of a hybrid. The 1.5 liter i-VTEC engine is coupled with a compact Integrated Motor Assist Hybrid System (IMA). This results in a combined output of as much as 136 ps and 19.4 kg-m of torque for manual transmission variants. A 3-Mode Drive System gives you an optimum and balanced drive whether you are driving in the city or the highway with normal, ECON, and Sport mode provide performance and efficiency that complement all driving needs. In Sport mode, The CR-Z delivers exciting performance that only a sporty hybrid car can offer. The Plus Sport System is an experience that is a push of a button away, with the S+ button that primes the engine for a sudden boost in performance. With this feature, CR-Z drivers can get the acceleration feeling similar to the V6, 3,000cc engine cars with the push of a button. Its swooping aerodynamic profile and the aggressive styling evoke an impression of awe with the new Sporty Grille and Front Bumpers, LED Daytime Running Lights (DRL), AND 17” Alloy Wheels. Adding to this, the rear wheel track was increased by 10 mm that makes for smoother and more excellent handling. The New CR-Z will inspire your drive, as you enter the cabin, it grants the driver full command with its advanced and intuitively designed controls. The “Exciting Mature Cockpit” includes the new Push Start System, and a 7-inch Touch Screen Display with navigation features also acts as a display for the multi-view camera system. A new center console between the seats incorporates an armrest and a storage compartment. Also found on the center console and replacing the old lever-style brake is the New Electric Parking Brake (EPB). This feature activates the holding mechanism with a push of a button. For new electrical features, include the Active Noise Control (ANC) that muffles sound reduction while the Active Sound Control (ASC) that provides an exciting sporty sound. The New CR-Z will come in a 6-speed Manual transmission (MT) and an electronically controlled Continuously Variable transmission (CVT) with 7-speed mode option, covering all customer preferences. 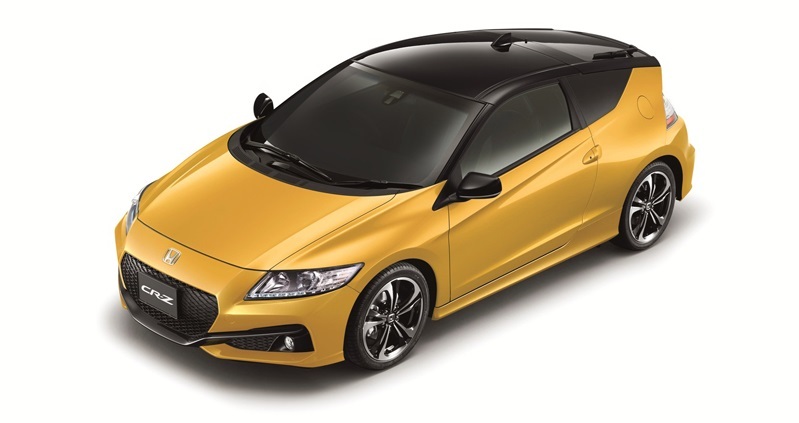 The New CR-Z 1.5 IMA comes with a new selection of 5 exciting colors including a new 2-Tone color option with a black painted roof, door mirrors, and tailgate. Customers may choose from Helios Yellow Pearl (2-Tone), Milano Red (2-Tone), Premium White Pearl (2-Tone), Brilliant Sporty Blue Metallic, Polished Metal Metallic. The New CR-Z 1.5 IMA will be available on January 2016.